Lee Kersteter knows the exact date that Bestemors Imports opened in Olde Mistick Village: April 17, 1986. Kersteter didn’t work here then – she’s been at the store 17 years – but that attention to detail and her level of investment in the store is reflected throughout. It also helps that Kersteter’s grandparents are from Norway, seeing how Bestemors, a Scandinavian gift shop, means “grandmother” in Norwegian. Her parents met at Sons of Norway after the two mothers raved about “a boy you should meet” and “a girl you should meet.” Skeptical, Kersteter’s father, planning a short outing, brought a friend. The Christmas party was in November and he married that girl in February. All this is to say, Kersteter was raised in and immersed in Scandinavian culture, and she brings that experience and mindset to Bestemors. The store’s main buyer, Kersteter knows what she’s looking for when she heads to shows in Minnesota and when vendors bring their wares to Mystic. She keeps an eye out for the interesting and the authentic. 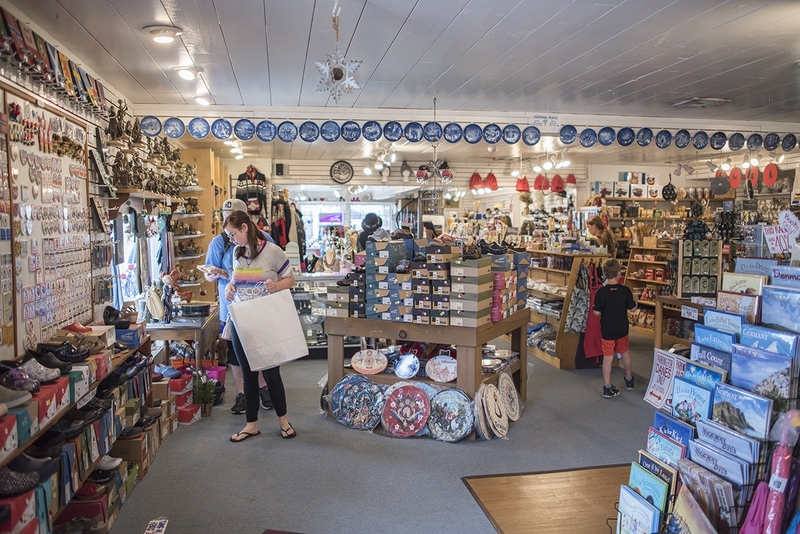 She said there are fewer than 100 “just Scandinavian” gift shops in the U.S.
“We have very loyal customers because there aren’t a lot of Scandinavian shops,” she said. Some might visit on Fridays for the cardamom bread and a hello, while others come in knowing they’ll find those items that aren’t available anywhere else. “I love these; they’re hard to find,” a customer remarked upon checking out one day in early October, clutching a Danish paper-cutting. The handmade cards are small works of art created by Oda Wiedbrecht, a Danish artist who only allows certain companies outside of Denmark to carry them, Kersteter said. Bestemors is packed with enough items to carry you through the holiday season and interesting enough to have you checking in anytime you’re in the area. There are capes and beautiful wool sweaters, high quality Ekelund linens, Danish Irons, taper candles and Danish ball candles. And there are Vikings, of course. Hundreds of Vikings. Thanks to shows like “Game of Thrones” and “Vikings”, there’s been a resurgence in the interest and popularity of these mysterious, mystical people, and Bestemors makes sure to satisfy the need, whether it’s tee-shirts (more than 30 Viking designs), figurines, children’s plastic Viking caps, or other fun items. “They’re more of a German background, but it fits what we do here very, very well,” Kersteter said. The store has also become known for its ample greeting card selection and its Dansko shoes – a uniquely comfortable and attractive line of footwear designed for professionals who spend a lot of time on their feet. Bestemors hosts Dansko trunk shows twice a year and sells thousands of pairs over the course of a year. Kersteter said the store is in the Top 6 in sales of Dansko in the Northeast. The shop also carries Troentorp, which has made wooden clogs for more than 100 years. The store carries a small stock of food items and will bring in more for the holidays season, including cakes, cookies, and some jarred fish selections. There are also plenty of candies, from chocolates to real-deal licorice (in other words, not of the Twizzlers variety). Bestemors is open Monday through Saturday from 10 a.m. to 6 p.m., and Sundays from 11 a.m. to 5 p.m. It is located in Olde Mistick Village at 27 Coogan Boulevard. You can also find thousands of items online at https://www.bestemorsimports.com, or call 860-536-7669 with specific inquiries.